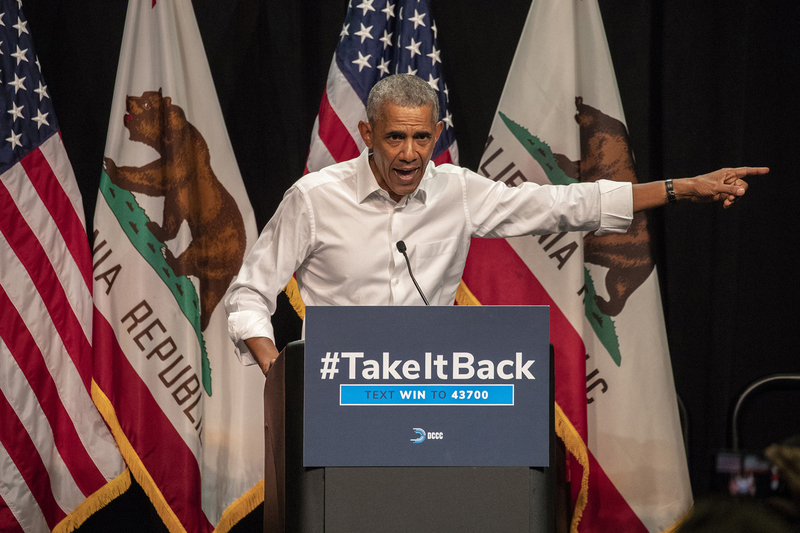 Former President Barack Obama attends a campaign event in Anaheim, Calif., for Democratic congressional candidates last Saturday. When presidents leave office, they usually disappear quietly from politics. After President Donald Trump’s inauguration in January 2017, former President Barack Obama followed that trend — until last week. In an inflammatory speech on Friday at the University of Illinois Urbana-Champaign, Obama excoriated the Republican party for the first time since leaving office — blaming them for Trump’s rise and his scandal-ridden presidency. This kind of highly partisan speech is unusual for a man who prided himself on working across party lines during his presidency, but Obama’s assessment of today’s polarized political climate is largely correct. Trump’s election reflects a recent exacerbation of the already vast political divides in our country — especially within the Republican party, but also across the entire political spectrum. Obama knows this firsthand from trying to work with congressional Republicans during his presidency. Ever since the tea party formed in response to Obama’s election in 2008, the gulf between far-right Republicans and moderates has made it nearly impossible to pass bipartisan bills — the Republican-majority Congress filibustered more than 500 bills when Obama was in office. The arrival of Trump in the presidency has hardly helped matters — even though he’s a Republican, his populist nationalist views bear very little resemblance to hard-right conservatives in the Freedom Caucus, whose views irk moderate Republicans as well. House Republicans couldn’t even agree to repeal the Affordable Care Act in 2017 — they all opposed it, but the Freedom Caucus wanted to completely overhaul Medicaid, while representatives of working class Republican voters worried it would financially harm their base. The Republican party can hardly be called one party anymore — it’s a messy conglomerate of social conservatives, libertarians and populists. And during the 2016 election season, Trump’s base brought vitriolic nationalism into the party, too. Still, as divided as the Republican party is, Democrats aren’t exactly united. The establishment contingent of Democrats who voted for Hillary Clinton in 2016 bear little resemblance to Sen. Bernie Sanders’ base — comprised mostly of far-left, grassroots millennials. In fact, the Democratic National Committee was at the center of a heated debate in August that ended in the party eliminating superdelegates — establishment Democrats whose enormous voting power in primaries angered Sanders supporters — from the first round of voting on presidential nominations. But with the midterm elections coming up in November, it makes sense that Obama wants to criticize Republicans in an effort to gain more votes for Democratic candidates, even if that means creating possible further division by accusing Republicans of, well, creating division. Even though Obama hasn’t put himself in the political fray recently, his opinion still carries a lot of weight with Democratic voters — who could all be persuaded to go vote just because of this speech, regardless of how far left they lean.